Journal of the House of Commons: Volume 9, 1667-1687. Originally published by His Majesty's Stationery Office, London, 1802. Sabbati, 23 die Maii, 1685. 1 Jac. IIdi. Resolution to support the King. King appoints to be attended. Dr. Sherlock to preach on 29 May. A PETITION of Henry Powle Esquire, touching the Election for Cirencester, was read. Ordered, That the said Petition be referred to the Consideration of the Committee of Elections and Privileges; to examine the Matter thereof; and to report the same, with their Opinions therein, to the House. A Petition of Edward Harley Esquire, complaining of the undue Return of Sir Roger Norwich, to serve in this present Parliament as Knight of the Shire for the County of Northampton, in Injury of the Petitioner, who was duly elected, and ought to have been returned, was read. Resolved, That the said Petition be referred to the Consideration of the Committee of Privileges and Elections; to examine the Matter thereof; and to report the same, with their Opinions therein, to the House. A Petition of Charles Herbert Esquire, touching the Election for Montgomery. 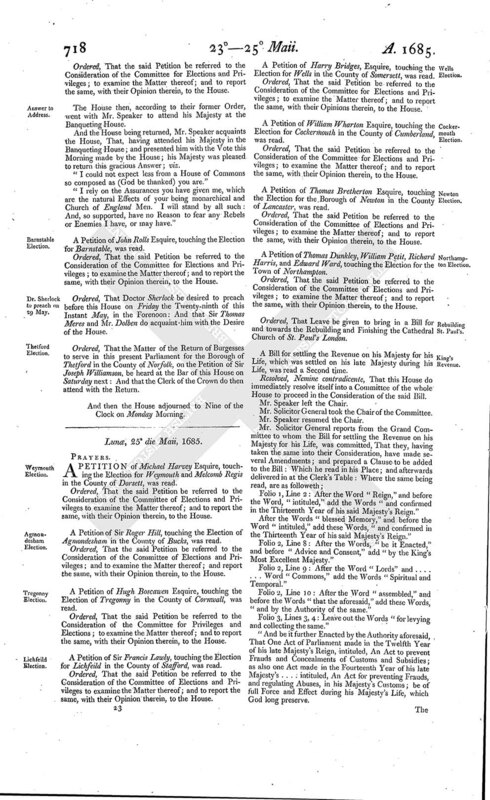 A Petition of the Mayor and Burgesses of the Town of Montgomery, and of the respective Boroughs of Llanidlos, Pool, and Llanvillin, were read. Ordered, That the Matter of the said several Petitions be heard at the Bar of the House, on next Monday Fortnight. A Petition of Thomas Freake Esquire, touching the Election for Cricklade; and a Petition of Edmund Webb Esquire, touching the same Election; were read. Resolved, That the said Petitions be referred to the Consideration of the Committee of Privileges and Elections; to examine the Matter thereof; and to report the same, with their Opinions therein, to the House. A Petition of Edward Viscount Latimer, and George Grenvill Esquire, complaining of the undue Election and Return of Sir Richard Temple and Sir Ralph Verney, to serve in this present Parliament for the Borough of Buckingham in the County of Bucks, in Injury of the Petitioners, who were duly elected, and ought to have been returned, was read. Resolved, That the said Petition be referred to the Consideration of the Committee of Privileges and Elections; to examine the Matter thereof; and to report the same, with their Opinion therein, to the House. A Petition of Sir Joseph Williamson, complaining of the undue Election and Return of Hen. Heveningham Esquire, as a Burgess for the Borough of Thetford in the County of Norfolk, to serve in this present Parliament, in Injury of the Petitioner, who was duly elected, and ought to have been returned, was read. Ordered, That the Matter of the said Petition be heard at the Bar of this House on Friday next. A Petition of the Burgesses of Calne in the County of Wilts, complaining of the undue Election and Return of Sir John Ernle and Thomas Webb Esquire, to serve in this present Parliament as Burgesses for the said Borough, in Injury of the Petitioners, was read. Ordered, That the said Petition be referred to the Consideration of the Committee of Elections and Privileges; to examine the Matter thereof; and to report the same, with their Opinion therein, to the House. A Petition of Sir Thomas Bellott Baronet, and William Leveson Gower Esquire, complaining of the undue Return and Election of Edw. Manwareing and Wm. Sneyd junior Esquire, as Burgesses for the Borough of Newcastle under Line, to serve in this present Parliament, in Injury of the Petitioners, who were duly elected, and ought to have been returned. Resolved, That the said Petition be referred to the Consideration of the Committee of Elections and Privileges; to examine the Matter thereof; and to report the same, with their Opinion therein, to the House. A Petition of William Palmes Esquire, complaining of the undue Return and Election of Mr. Fairfax and Mr. Worsley, as Burgesses for the Borough of New Malton in the County of York, to serve in this present Parliament, in Injury of the Petitioner, who was duly elected, and ought to have been returned. Resolved, That the said Petition be referred to the Consideration of the Committee of Elections and Privileges; to examine the Matter thereof; and to report the same, with their Opinions therein, to the House. 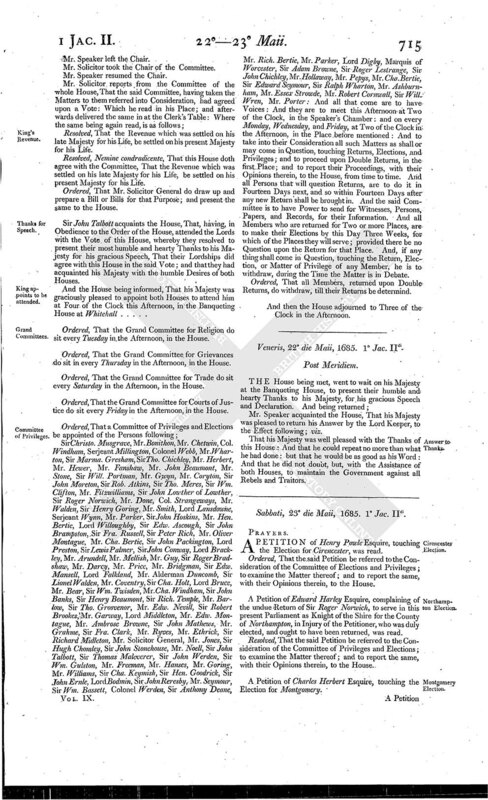 A Petition of Richard Skinner, and others, Inhabitants of the Borough of Walling ford, complaining of the undue Return of John Stone and John Holloway Esquires, as Burgesses to serve in this present Parliament for the said Borough, was read. 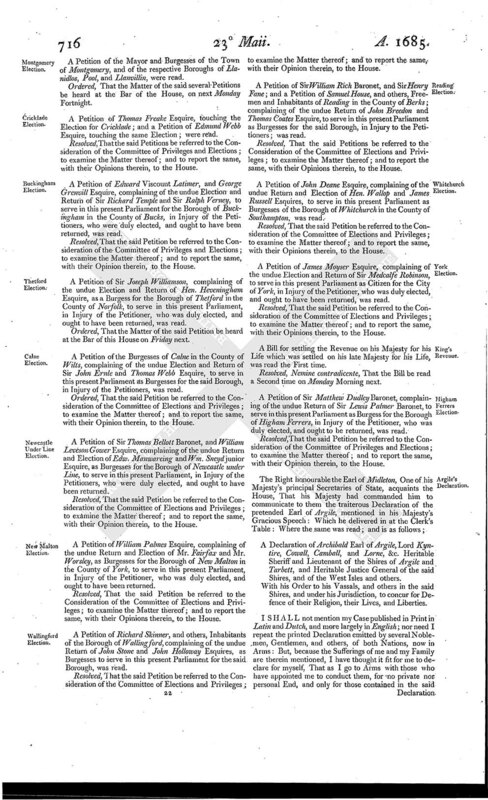 A Petition of Sir William Rich Baronet, and Sir Henry Fane; and a Petition of Samuel House, and others, Freemen and Inhabitants of Reading in the County of Berks; complaining of the undue Return of John Breedon and Thomas Coates Esquire, to serve in this present Parliament as Burgesses for the said Borough, in Injury to the Petitioners; was read. Resolved, That the said Petitions be referred to the Consideration of the Committee of Elections and Privileges; to examine the Matter thereof; and to report the same, with their Opinions therein, to the House. A Petition of John Deane Esquire, complaining of the undue Return and Election of Hen. Wallop and James Russell Esquires, to serve in this present Parliament as Burgesses of the Borough of Whitchurch in the County of Southampton, was read. A Petition of James Moyser Esquire, complaining of the undue Election and Return of Sir Medcalfe Robinson, to serve in this present Parliament as Citizen for the City of York, in Injury of the Petitioner, who was duly elected, and ought to have been returned, was read. A Bill for settling the Revenue on his Majesty for his Life which was settled on his late Majesty for his Life, was read the First time. Resolved, Nemine contradicente, That the Bill be read a Second time on Monday Morning next. A Petition of Sir Matthew Dudley Baronet, complaining of the undue Return of Sir Lewis Palmer Baronet, to serve in this present Parliament as Burgess for the Borough of Higham Ferrers, in Injury of the Petitioner, who was duly elected, and ought to be returned, was read. A Declaration of Archibald Earl of Argile, Lord Kyntire, Cowall, Camball, and Lorne, &c. Heritable Sheriff and Lieutenant of the Shires of Argile and Tarbett, and Heritable Justice General of the said Shires, and of the West Isles and others. With his Order to his Vassals, and others in the said Shires, and under his Jurisdiction, to concur for Defence of their Religion, their Lives, and Liberties. I SHALL not mention my Case published in Print in Latin and Dutch, and more largely in English; nor need I repeat the printed Declaration emitted by several Noblemen, Gentlemen, and others, of both Nations, now in Arms: But, because the Sufferings of me and my Family are therein mentioned, I have thought it fit for me to declare for myself, That as I go to Arms with those who have appointed me to conduct them, for no private nor personal End, and only for those contained in the said Declaration, which I have concerted with them, and approve of; so I claim no Interest but what I had before the pretended Forfeiture of my Family, and have sufficient Right to: And that I do freely, and as a Christian, fully forgive all personal Injuries against my Person, or Family, to all that shall not oppose, but join and concur with us in our present Undertaking, for the Ends mentioned in the said Declaration: And hereby I oblige me never to pursue them in Judgment, nor out of Judgment. And I further declare, That, obtaining the peaceable and quiet Possession of what belonged to my Father and myself, before our pretended Forfeitures, I shall satisfy all Debts due by my Father and myself, as my Heir or Debtor can be obliged: And as my Faithfulness to his late Majesty and his Government hath sufficiently appeared to all unbiassed Persons void of Malice, so I do with Grief acknowledge my former too much complying with and conniving at the Methods which have been taken to bring us to the said Condition we are now in; though, God knows, never concurring in the Design. I have now, with God's Strength, suffered patiently my unjust Sentence and Banishment Three Years and a half; and have never offered to make any Uproar or Defence by Arms, to disturb the Peace, upon my private Concern: But the King being now dead, and the Duke of Yorke having taken off his Mask, and having abandoned and invaded our Religion and Liberties, resolving to enter into the Government, and exercise contrary to Law, I think it not only just, but my Duty to God and my Country, to use my utmost Endeavours to oppose and repress his Usurpation and Tyranny. And therefore, being assisted and furnished very nobly by several good Protestants, and invited and accompanied by several of both Nations to lead them, I resolve, as God shall enable me, to use their Assistance of all Kinds towards the Ends expressed in the said Declaration. And do hereby earnestly invite and obtest all honest Protestants, and particularly all my Friends and Blood Relations, to concur with us in the said Declaration. And as I have written several Letters, so, having no other Way fully to intimate my Mind otherwise, I do hereby require all my Vassals every-where, and all within my several Jurisdictions, with their fensible Men within their Command, to go to Arms, and to join and concur with us, according to the said Declaration, as they will be answerable, at their Peril; and to obey the particular Orders they shall receive from me from time to time. Resolved, Nemine contradicente, That this House will stand by and assist his Majesty with their Lives and Fortunes against Archibald Campbell, the pretended Earl of Argile, and his Adherents, and all Rebels and Traitors, and all others whatsoever that shall assist them, or any of them. Resolved, &c. That this House will, in a Body, attend his Majesty, and present him with this Vote. Ordered, That such Members of this House, as are of his Majesty's most honourable Privy Council, do humbly desire his Majesty to appoint a time when this House may attend him. A Petition of Samuell Rolls Esquire, complaining of the undue Election and Return of Sir John Corriton to serve in this present Parliament as Burgess for the Borough of Callington in the County of Devon, in Injury of the Petitioner, who was duly elected, and ought to have been returned, was read. Resolved, That the said Petition be referred to the Consideration of the Committee for Elections and Privileges; to examine the Matter thereof; and to report the same, with their Opinion therein, to the House. A Petition of the Lord Sterling, complaining of the undue Election and Return of Richard Southby Esquire, to serve in this present Parliament as Knight of the Shire for the County of Berks, in Injury of the Petitioner, who was duly elected, and ought to have been returned, was read. A Petition of John Mitchell and Richard Brodrick, complaining of the undue Election and return of Hugh Hodges and Tho. Chaffe, Esquire, to serve in this present Parliament as Burgesses for the Borough of Bridport in the County of . . . ., in Injury of the Petitioners, who were duly elected, and ought to have been returned, was read. Resolved, That the said Petition be referred to the Consideration of the Committee for Elections and Privileges; to examine the Matter; and to report the same, with their Opinion therein, to the House. A Petition of John Connyers Esquire, complaining of the undue Election and Return of Simon Smith, and Tho. Jones, Esquires, to serve in this present Parliament as Burgesses for the Borough of East Grinstead, in Injury of the Petitioner, who was duly elected, and ought to have been returned, was read. 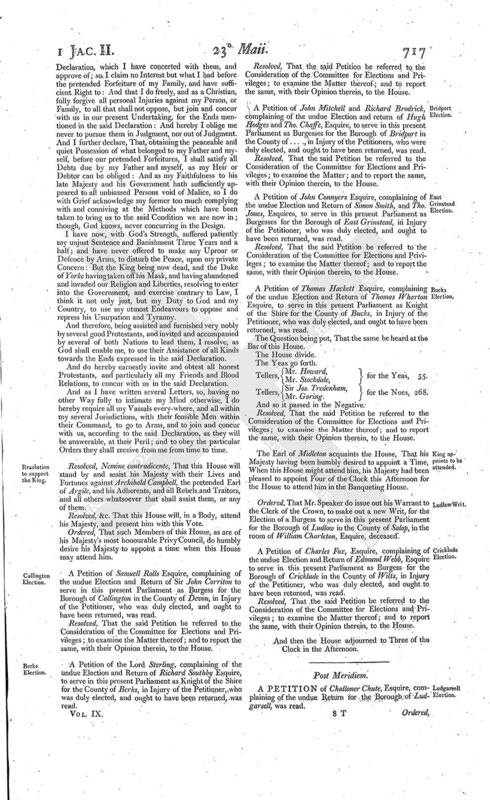 A Petition of Thomas Hackett Esquire, complaining of the undue Election and Return of Thomas Wharton Esquire, to serve in this present Parliament as Knight of the Shire for the County of Bucks, in Injury of the Petitioner, who was duly elected, and ought to have been returned, was read. The Question being put, That the same be heard at the Bar of this House. Tellers, Mr.Howard, for the Yeas, 55. Tellers, Sir Jos. Tredenham, for the Noes, 268. And so it passed in the Negative. The Earl of Midleton acquaints the House, That his Majesty having been humbly desired to appoint a Time, When this House might attend him, his Majesty had been pleased to appoint Four of the Clock this Afternoon for the House to attend him in the Banqueting House. Ordered, That Mr. Speaker do issue out his Warrant to the Clerk of the Crown, to make out a new Writ, for the Election of a Burgess to serve in this present Parliament for the Borough of Ludlow in the County of Salop, in the room of William Charleton, Esquire, deceased. A Petition of Charles Fox, Esquire, complaining of the undue Election and Return of Edmund Webb, Esquire to serve in this present Parliament as Burgess for the Borough of Cricklade in the County of Wilts, in Injury of the Petitioner, who was duly elected, and ought to have been returned, was read. And then the House adjourned to Three of the Clock in the Afternoon. A PETITION of Challoner Chute, Esquire, complaining of the undue Return for the Borough of Ludgarsell, was read. Ordered, That the said Petition be referred to the Consideration of the Committee for Elections and Privileges; to examine the Matter thereof; and to report the same, with their Opinion therein, to the House. The House then, according to their former Order, went with Mr. Speaker to attend his Majesty at the Banqueting House. And the House being returned, Mr. Speaker acquaints the House, That, having attended his Majesty in the Banqueting House; and presented him with the Vote this Morning made by the House; his Majesty was pleased to return this gracious Answer; viz. "I could not expect less from a House of Commons so composed as (God be thanked) you are." "I rely on the Assurances you have given me, which are the natural Effects of your being monarchical and Church of England Men. I will stand by all such: And, so supported, have no Reason to fear any Rebels or Enemies I have, or may have." A Petition of John Rolls Esquire, touching the Election for Barnstable, was read. Ordered, That Doctor Sherlock be desired to preach before this House on Friday the Twenty-ninth of this Instant May, in the Forenoon: And that Sir Thomas Meres and Mr. Dolben do acquaint him with the Desire of the House. Ordered, That the Matter of the Return of Burgesses to serve in this present Parliament for the Borough of Thetford in the County of Norfolk, on the Petition of Sir Joseph Williamson, be heard at the Bar of this House on Saturday next: And that the Clerk of the Crown do then attend with the Return. And then the House adjourned to Nine of the Clock on Monday Morning.